I needed a lightweight and waterproof pair of sandals to wear in the raft during my Grand Canyon trip. 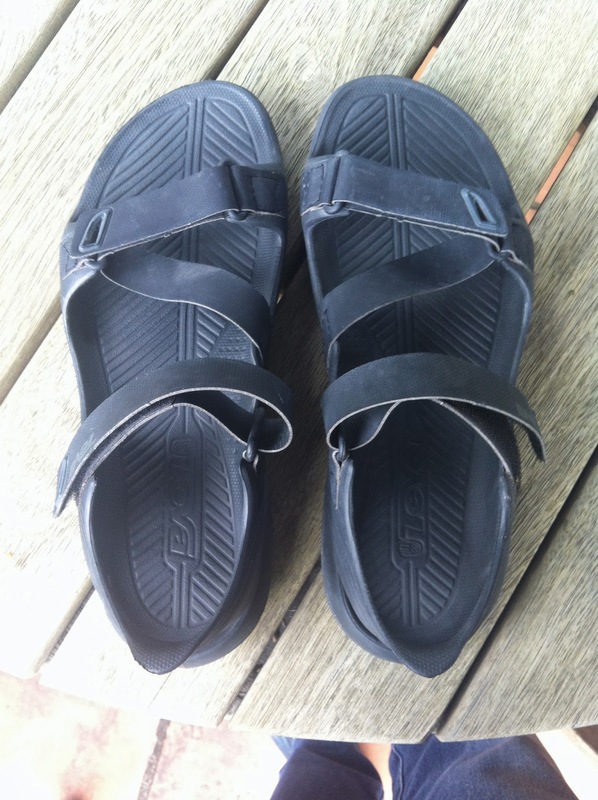 After some research I settled on the Teva Barracuda. In NZ these retail for $99. I purchased them for $US36 from Zappos in the US and had them delivered free to my hotel to collect on arrival - what a bargain! These sandals have an injection-molded upper of EVA with footbed channels and drain holes. Open toe construction allows for water to drain quickly. They are designed for surf and sand versatility and have adjustable hook-and-loop straps at ankle and toe for a preferred fit. Superlight foam in the midsole for added comfort and flexibility with a Durabrasion™ rubber outsole providing superior grip and lasting tread. These sandals performed very well. I'd love to use them as "camp" shoes, but although very light at 340 grams (total weight of the pair) I will stick with my current set-up (see gear list) or Teva thongs and toe socks - 255 grams. If I took these sandals I would still need to include the spare socks weight. Is that 340 grams per shoe or for the pair?